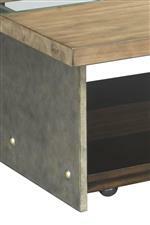 This end table's industrial design is created by its mixed material construction and attention to detail. The metal trim highlights the contrast of the natural wood top and the cocoa brown finish of the base. The Modern Origins Industrial End Table with Metal Trim by Hammary at Crowley Furniture & Mattress in the Kansas City Area: Liberty and Lee's Summit, MO & Overland Park, KS area. Product availability may vary. Contact us for the most current availability on this product. This collection has been designed to highlight the natural beauty found in the various materials used in its construction. This appreciation of natural elements has been blended with sleek industrial style. All this creates pieces perfect for your modern home that have a well-loved look, which will only continue to grow over time. The Modern Origins collection is a great option if you are looking for Industrial Contemporary furniture in the Kansas City Area: Liberty and Lee's Summit, MO & Overland Park, KS area. Browse other items in the Modern Origins collection from Crowley Furniture & Mattress in the Kansas City Area: Liberty and Lee's Summit, MO & Overland Park, KS area.